"The design of this product emphasizes getting as much juice for your buck as possible!" With 700 watts of power behind the motor, the BELLA 13454 Juice Extractor is a great example of the middle-of-the-road options that are available to those are serious about juicing. 700 watts isn’t the most powerful on the market, but it’s still very impressive. To be sure, 700 watts is a lot stronger than some of the other juicers you will find in the 20-30 dollar range. That’s right. This juicer not only comes to us from BELLA, which has become one of the leaders in juice extractor manufacturing, but it is also one of the most affordable juicers you are going to find anywhere. If you have been meaning to get into the world of juicing, this is one of the first products we think you need to consider. It is perfect for beginners, but it can also hold some charm for experienced juicers who need something simple-but-effective for one situation or another. The appeal behind this Bella juicer is considerable, offering numerous benefits. 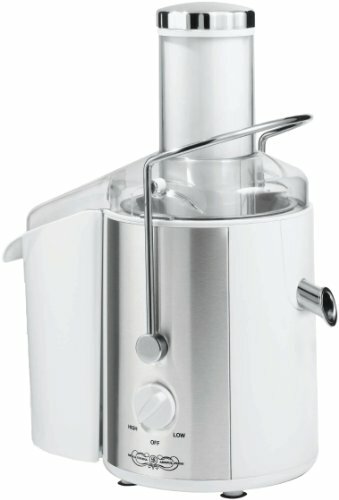 New to the world of juicing? You’re going to love how simple this thing is. Just don’t let that fool you into thinking this juicer may lack in one capacity or another. This product is pretty close to perfect, and that begins with the moment you take it out of the box. Setting up this juicer is a breeze. There are two settings for speed. You won’t have to worry too much about figuring things out. You will also want to note the wide feed tubes, making prep time a snap. You are going to find it really easy to take everything apart for (dishwasher safe!) cleaning as needed. The instruction manual is crystal clear in this regard. The detachable elements are easy to separate when it comes time to clean your juicer. The stainless steel elements to this product go a long way towards not only durability, but also when it comes time to clean everything. Since this product is dishwasher safe, you can clean everything quickly. Make sure to read your instruction manuals carefully regarding dishwashers and the cleanup. BELLA has a pretty good reputation with casual consumers and juicing fanatics alike. Ask anyone, and they will likely tell you that in terms of juice quality, you don’t have anything to worry about. The end result is consistent. You are going to get the best parts of the fruits and vegetables you are planning to use in your recipes. Make sure to follow recipe directions, in order to ensure everything taste exactly as it should. Regardless of what you decide to make, the juice quality should remain consistently appealing. The design of this product emphasizes getting as much juice for your buck as possible. You will also want to remember the wide feed tubes. This makes it easy to add exactly what you want. More often than not, you will be able to add as much as you want, as well. The results should be the same, no matter what. BELLA is well-known for creating juicers that are capable of getting a fantastic juice yield each and every time. It isn’t just about quality. With juicers, quantity is important, as well. As discussed earlier in our review, the BELLA 13454 is pretty tough with its 700 watt motor. This isn’t the most powerful motor on the market by any means. But 700 watts is pretty powerful, and it is going to give you the results you are looking for, more often than not. To put it another way, this juicer has a motor that should be able to meet most of your juicing needs. Stronger options are out there, but you may not need 1000 watts, or anything else along those lines. One of the biggest considerations will come down to noise. You may think all juicers are the same in this regard, but you would be wrong. Some juicers are definitely noisier than others. With the Bella 13454, you’re going to be pleased. If you have to use the juicer at odd hours, such as during periods where others in your home or apartment complex are sleeping, you will find this juicer to be fairly quiet. Juicers make noise, but this is one of the better examples. This isn’t the newest product from the juicer geniuses at Bella, but it still has plenty to offer a wide range of interests. Newcomers and experienced juicers alike are going to find a great deal about this juicer that will be worth getting excited about. Easy to operate, easy to clean, and less noisy than many other juicers on the market, the 13454 is an excellent way to get the fruits and vegetables you need on a daily basis. We also love the splash-free lid, 1-liter cup, and simple pouring spot. This juicer wins in every category that matters. Pretty darn quit! We were pleasant surprised!. 700 watts of power means that it will work just fine for most needs. Standard 3 inch chute feed.